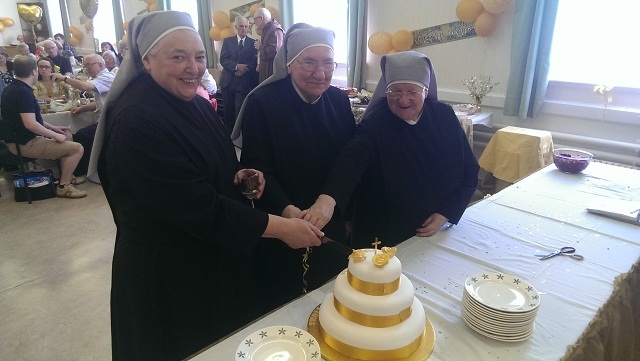 Three members of the Preston community of the Little Sisters of the Poor, Sisters Bernardine, Patricia and Maria, had the joy of celebrating their golden jubilee of Religious Profession last Saturday. The jubilarians were joined for the Mass of celebration both by members of their own families as well as other Little Sisters from neighbouring communities. 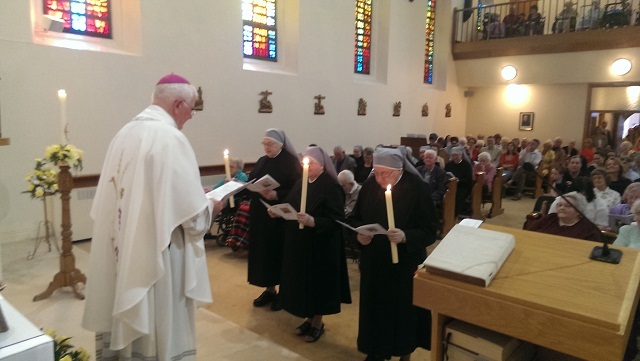 During the liturgy the three sisters renewed their religious vows, first taken fifty years ago. 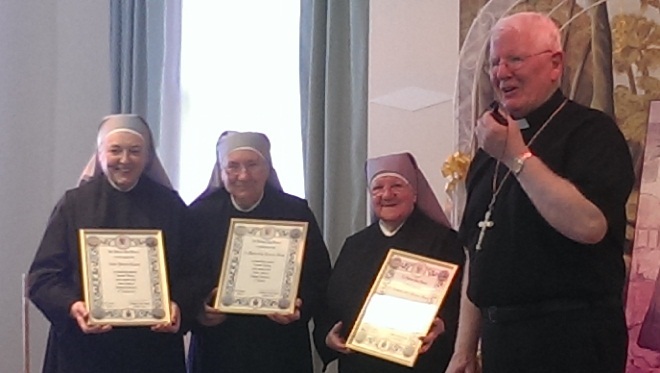 In the course of my homily (here) I made a point both of congratulating the sisters on this very significant milestone in their religious life, but also thanking them on behalf of the Church for those many years of witness and service to the elderly in various parts of the world. The Little Sisters, inspired by their foundress St. Jeanne Jugan, have a particular care for the frail and elderly, and dedicate themselves unselfishly to caring for those men and women in the evening of their lives. 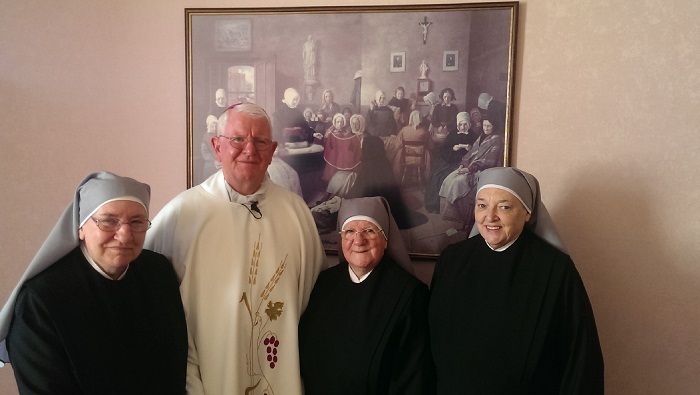 The Little Sisters also take a vow of hospitality, a virtue which is so evident to all who enter their homes. I mused on the marvellous fact of one hundred and fifty years of religious witness given by the three sisters celebrating their jubilees, and just how often they will have brought the mercy and healing of the compassionate Christ to innumerable men and women in the later stages of their life’s journey, and especially at its end. 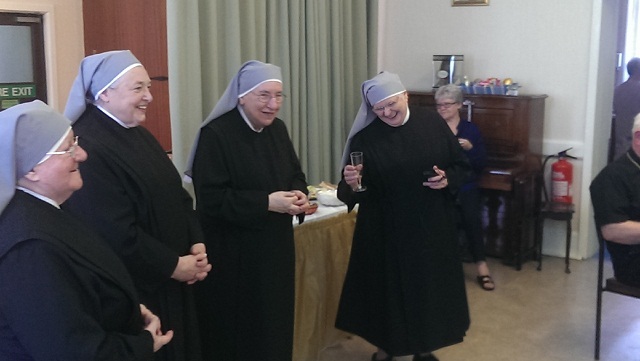 The need for the Little Sisters’ communities is as great as ever in our day. May their prayers for vocations to continue their work be answered by the Lord, and young people be generous in their response! The Canons of the Cathedral Chapter had one of their two annual meetings followed by Mass in the cathedral on Tuesday. Currently, the Chapter is also the College of Consultors in the Diocese. On Tuesday evening I travelled to Our Lady & St. Michael’s Parish, Alston Lane, to administer the sacrament of Confirmation to Year 6 of the Primary School. A pleasant, near summer evening in this rural setting, added to what was a very happy and grace-filled parish occasion for the young people, their families and friends, and of course their parish priest. The children appeared to be exuberant afterwards, and my prayer is that the newly-Confirmed will be graced with that sense and awareness of the gentle presence of the Holy Spirit throughout their lives. 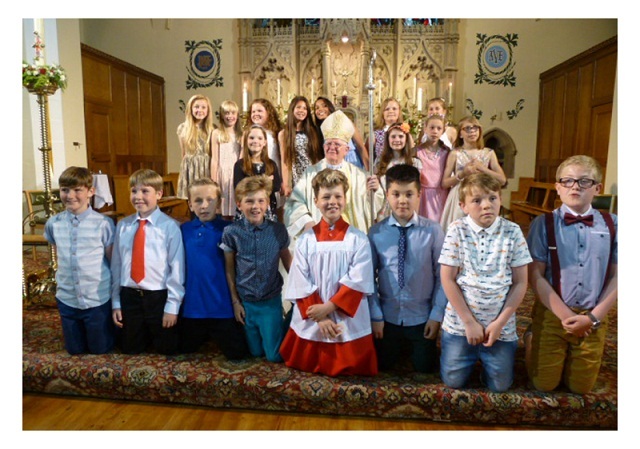 Finally, on Thursday I celebrated Confirmations at Our Lady & St Edward’s, Preston where the preparation of the 24 candidates and the prayerful silence of the children, parents and congregation were most impressive and an inspiration into deeper faith for all. 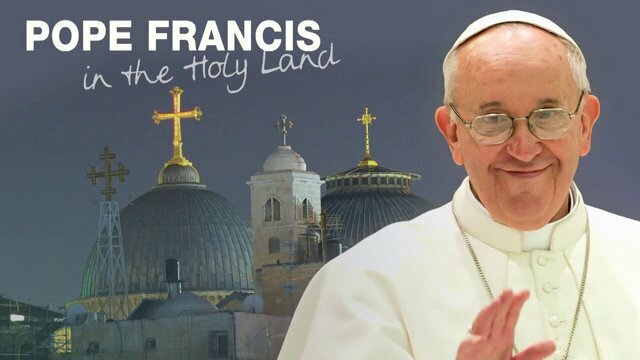 This weekend we offer our prayerful support for the success of the Holy Father Pope Francis’ Pilgrimage to the Holy Land which has now begun. 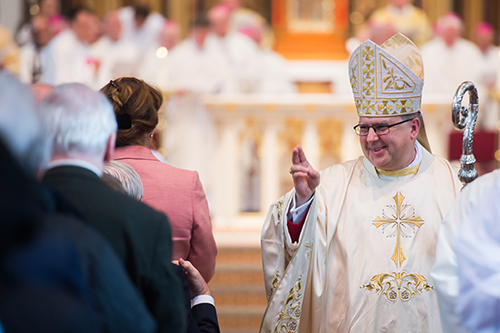 This week: Birmingham, Preston and a Priestly Jubilee! 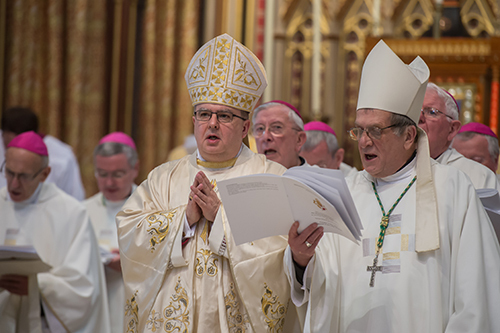 I joined many of the Bishops of England & Wales, and from further afield, on Tuesday in St. Chad’s Cathedral, Birmingham for the Episcopal ordination of Fr. 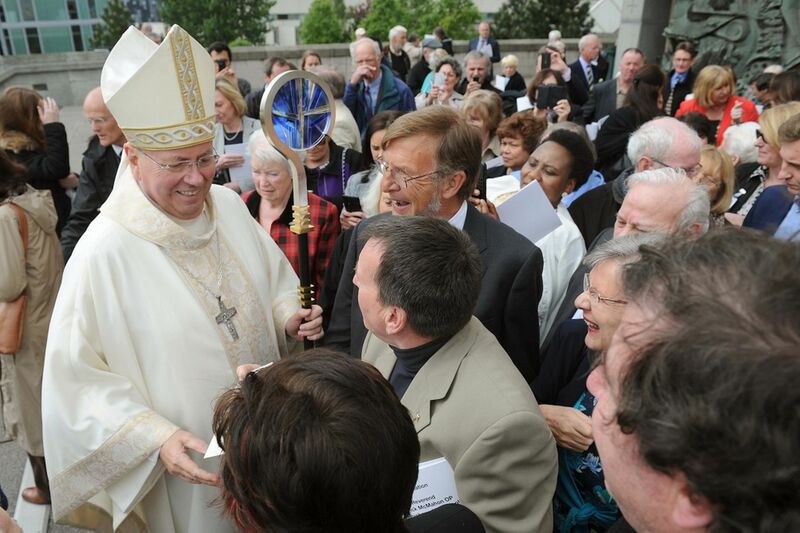 Robert Byrne as a new auxiliary bishop of the Archdiocese of Birmingham, at which the chief-consecrator was the Archbishop, Bernard Longley. 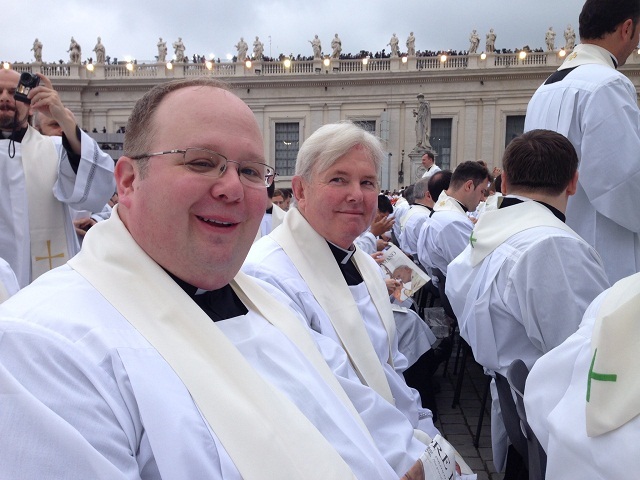 The lovely and imposing cathedral was filled with bishops, priests and people for the Mass of Ordination. 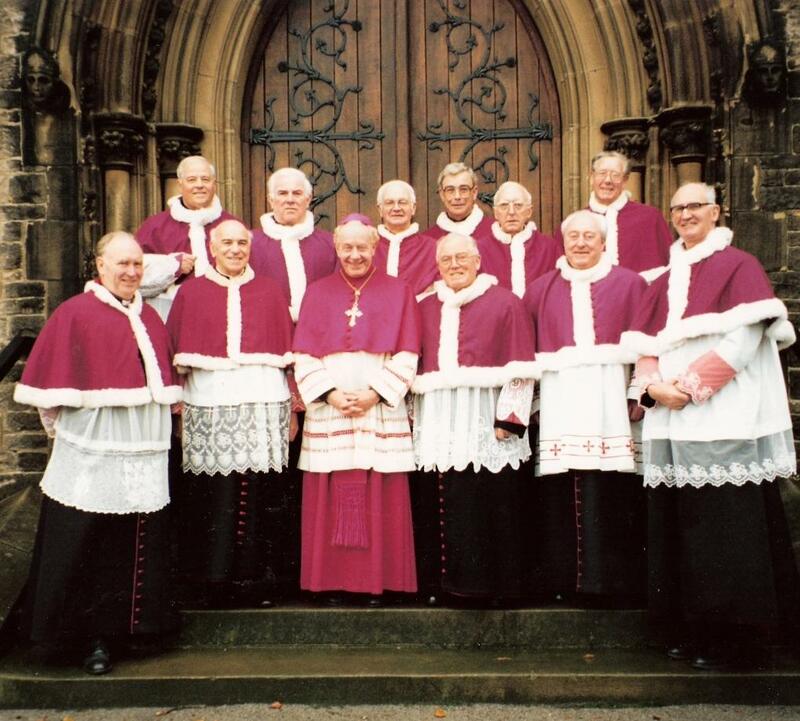 Bishop Byrne is a member of the Congregation of the Oratory, the same Congregation to which Blessed Cardinal Newman belonged, so in a sense it was fitting that an Oratorian priest should become a bishop in Birmingham where the great man spent so many years of his priestly life. 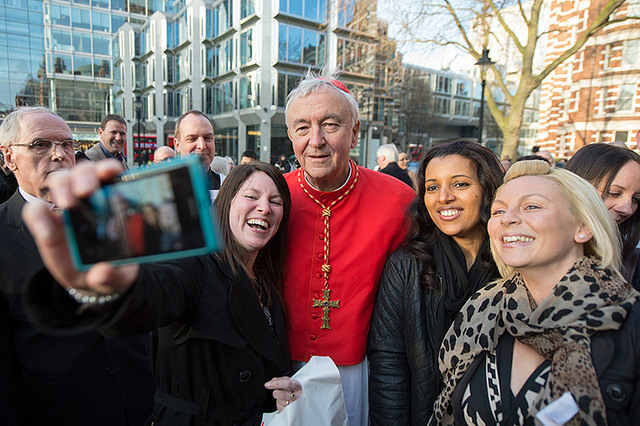 The influence and memory of this great English Cardinal and now Blessed remains strong, not least in the Midlands, and he was no stranger in his own lifetime to St. Chad’s Cathedral where a fellow Oratorian has now been ordained bishop. I suspect his Eminence from his place in heaven permitted himself a smile as he watched the liturgy of ordination unfold there on Tuesday. 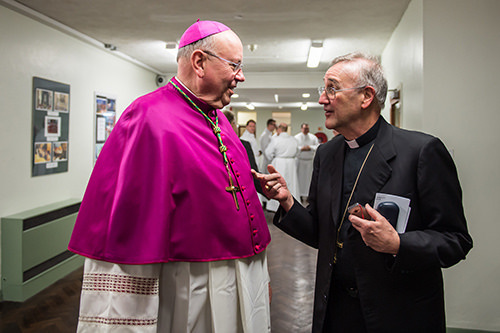 We wish Bishop Byrne every blessing as he begins his Episcopal ministry for the faithful of Birmingham, and he will surely enjoy the wonderful patronage of Blessed John Henry Newman and that most attractive saint and founder of the Oratorians, St. Philip Neri. The significance to us of doors and entrances was brought home to me on Friday morning as I blessed the newly constructed entrance to St. Maria Goretti Catholic Primary School in East Preston. 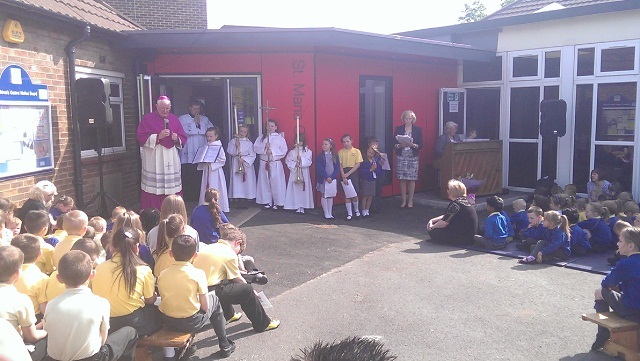 The wonderful warm sunshine meant that the whole school could gather in the area opposite the new entrance and join in the service of blessing. 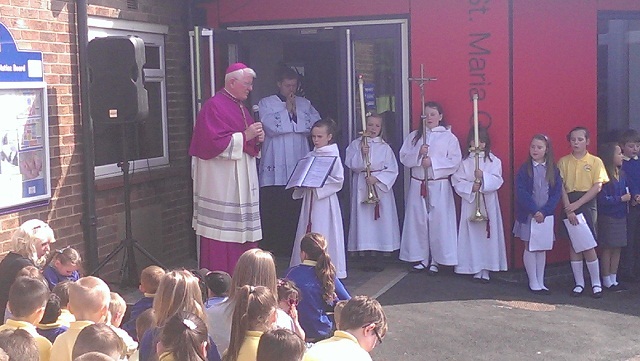 The aspirations expressed in the prayers of intercession read by the pupils asked that the school entrance would welcome all who passed through it, and that it may be the doorway to a place of learning as well as mutual care and respect. I sprinkled the doorway and entrance with holy water invoking God’s protection and blessing and the presence of Christ, the teacher of us all. We all pass through many doors in the course of our lives, and a very important one is the doorway to a school. May the community of St. Maria Goretti’s Primary School continue to be a place of welcome and learning for all who enter it! 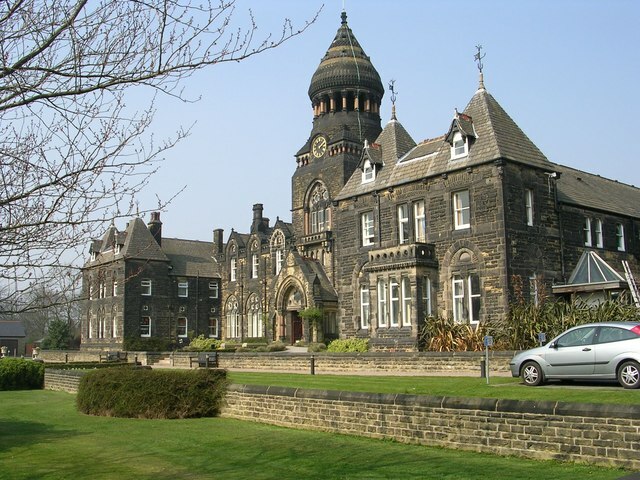 I then made the short journey through Preston to Blessed Cardinal Newman College where I offered Mass for those leaving the college on the completion of their examinations. My homily is here. Cardinal Newman College has upwards of two thousand five hundred students on its roll and has developed into a fine sixth form campus over the years, enhanced yesterday by the fine sunshine and well maintained grounds. The Mass took place in the attractive school chapel, once the convent chapel of the FCJ Sisters, known as Larkhill Convent School. I received a warm welcome from all whom I met, both staff and students, and it was pleasure to visit this state of the art Catholic college. 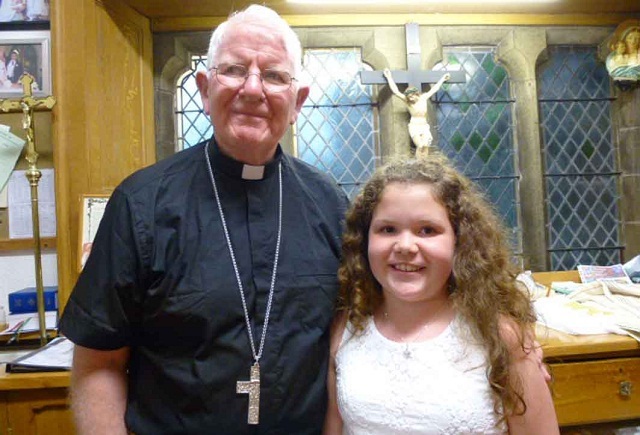 Not too many priests are blessed to arrive at their diamond jubilee of ordination, so there was great joy in the united parish of Milnthorpe and Arnside on Friday evening when Mgr. 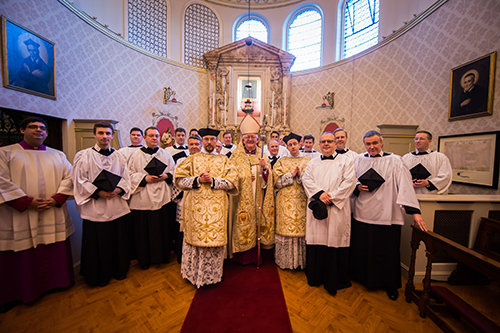 Frank Slattery (pictured below with the Chapter on the front row – far right) celebrated his sixtieth year of priesthood in Christ the King Church, Milnthorpe. Many friends and brother priests joined Mgr Slattery for what was a moving and joyful Mass of Thanksgiving, with the chief-celebrant being the jubilarian himself. 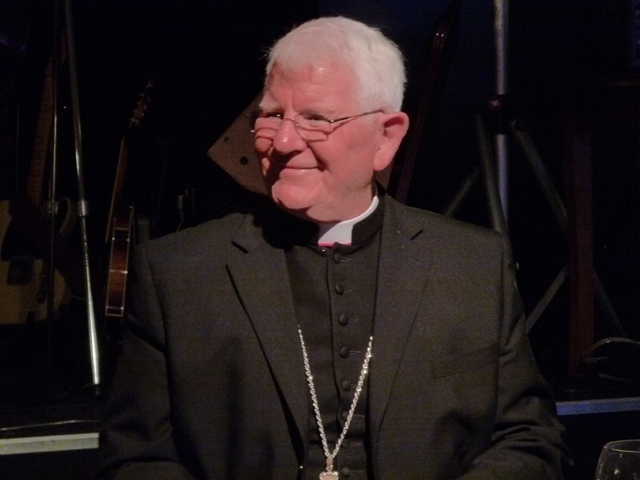 In the course of his homily Mgr Slattery reflected on the changes and events both in the world and in the Church he has witnessed during those sixty years. 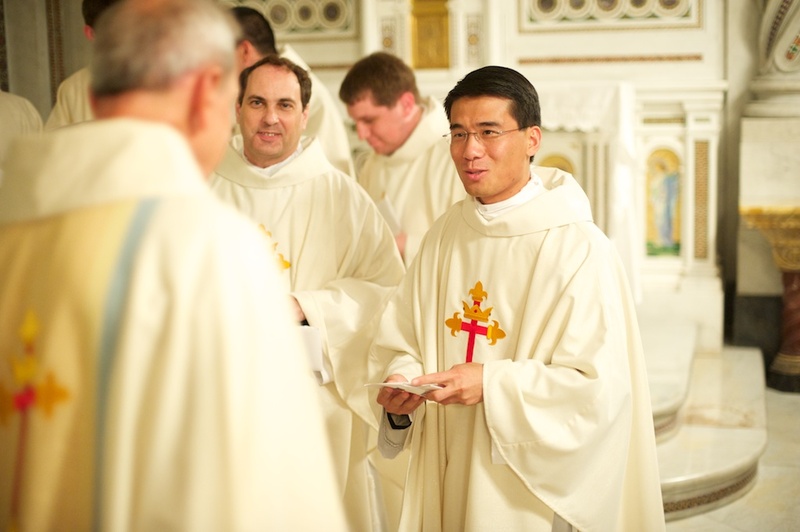 He expressed great gratitude to the Lord for his priestly vocation and for the privilege of ministering to his people. 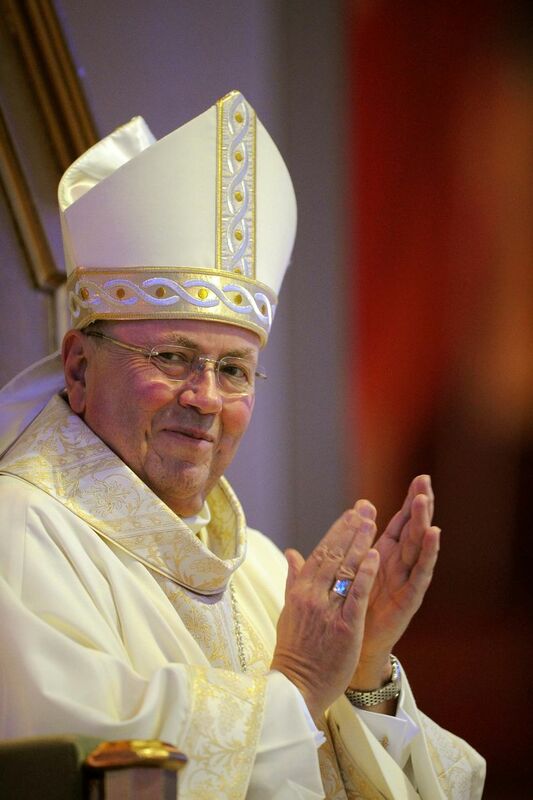 On behalf of the diocese and the wider Church I offered a brief word of sincere thanks to Monsignor for his long years of priestly loyalty, with the wish that there may be others to follow the example of his steadfast commitment to a priestly vocation. 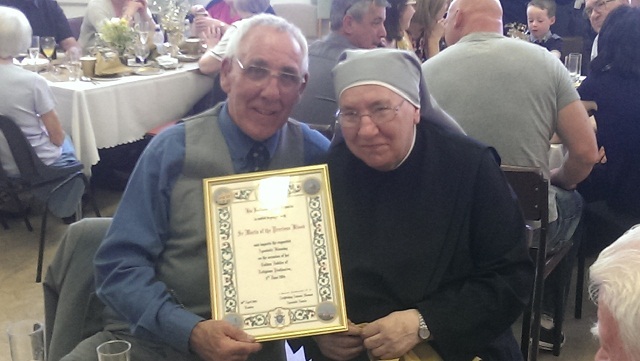 Ad multos annos, Mgr Slattery! 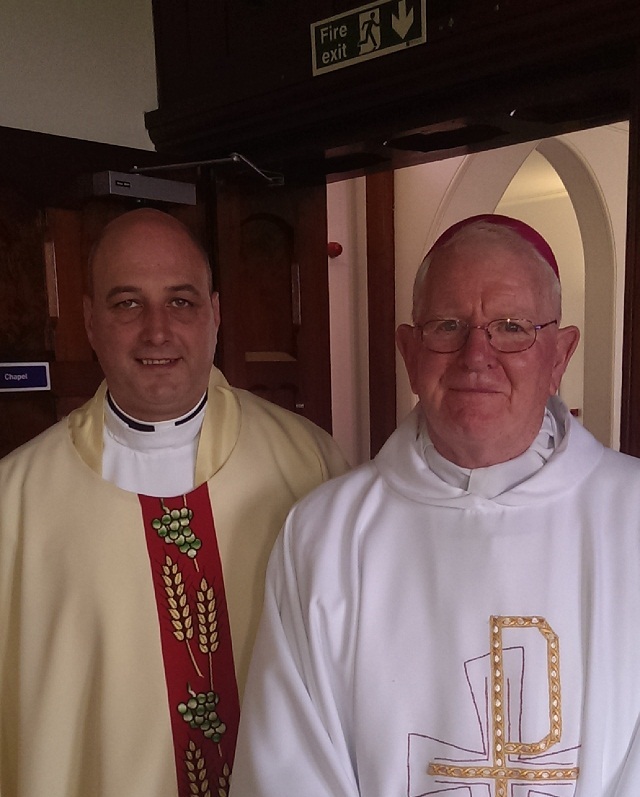 Last Sunday I went to Dodding Green, near Kendal, and to the Cenacolo Community where I offered Mass on the occasion of their ninth anniversary of foundation. 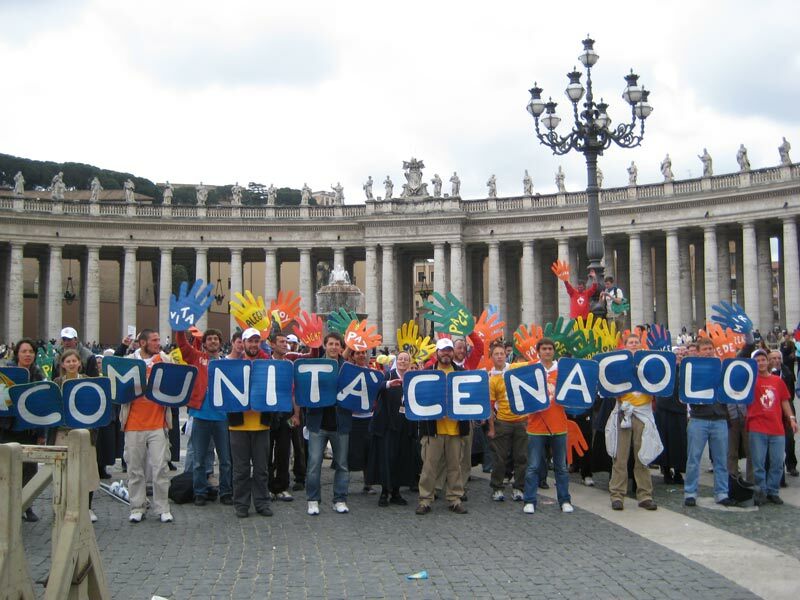 The Cenacolo Community, begun in 1983 in Saluzzo, Northern Italy by the very remarkable Italian nun, Mother Elvira, assists young men and young women to make the often arduous journey away from a destructive life of addiction, especially to drugs or alcohol. The Kendal community usually comprises about twelve young men from different countries who can spend a year or more there as they make this journey of rehabilitation. It was touching to meet the parents of some the young men who had travelled from Italy to be with them for this anniversary, and to hear how reassured they felt at their sons’ progress. 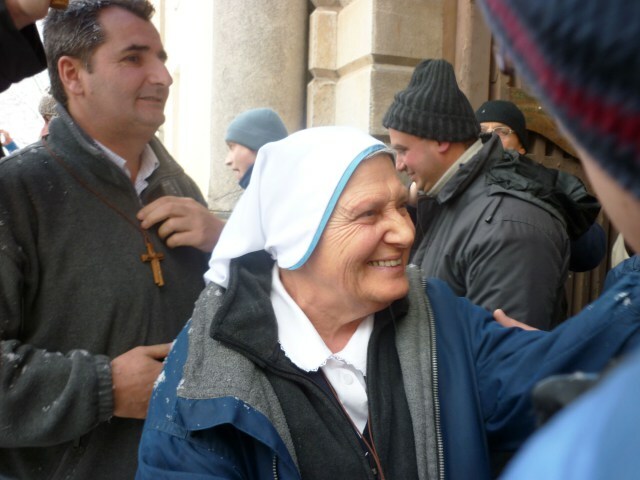 Self-discipline and manual labour, allied to a regular life of daily prayer, are essential elements in Mother Elvira’s original vision for these young people. 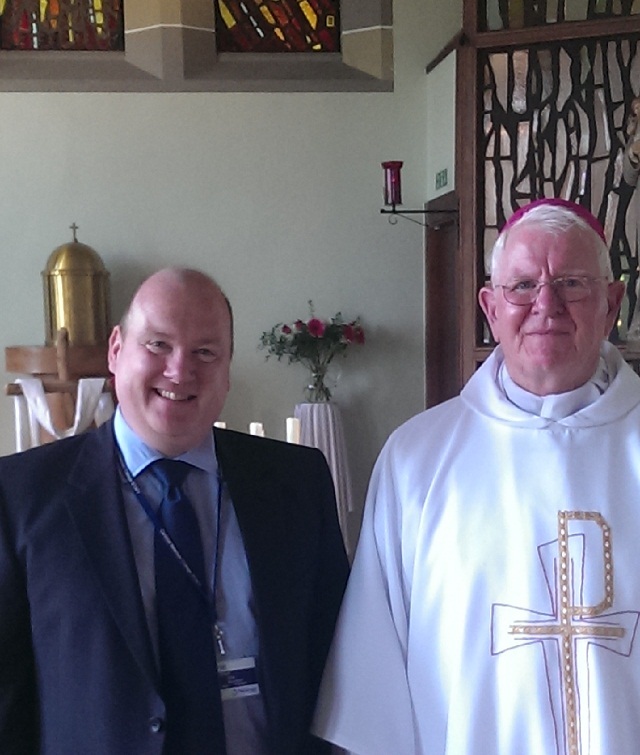 As I visit Cenacolo in Dodding Green I am most impressed by the transformation of the buildings and terrain which has taken place over these years, and reflects great credit on the priests and many friends of Cenacolo who are so solid in their support, both materially and spiritually, of the community. I like to think that this external transformation reflects the inner change within the young men as they respond to the grace of God’s Holy Spirit during the time they spend here. 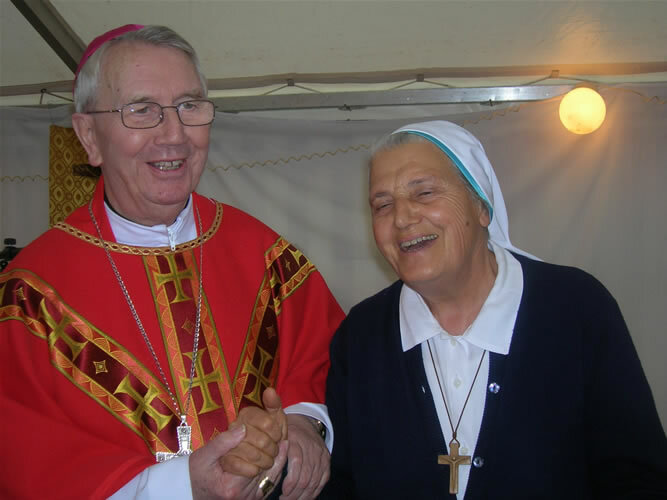 Cenacolo, now established in many countries, is surely a work of the gospel in our time and a testimony to the determination and vision of Mother Elvira. May this wonderful work continue to enjoy God’s blessing! 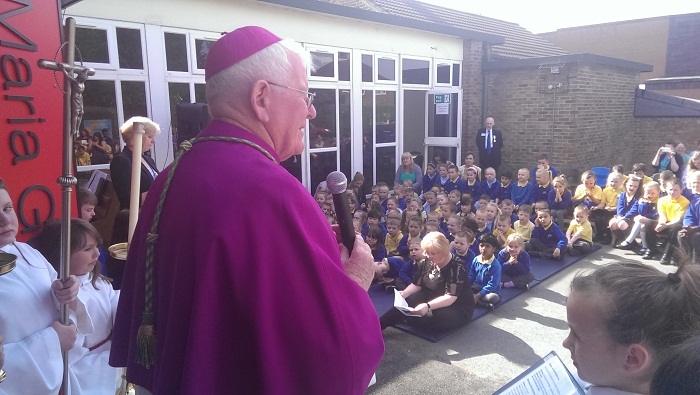 At the end of the Mass we remembered in prayer my predecessor Emeritus Bishop Patrick O’Donoghue who was 80 that day, has had a close relationship with the Community and who was instrumental in the foundation of the Community at Dodding Green in 2005. The rest of my week was taken up with the spring meeting of the Bishops’ Conference of England & Wales in Hinsley Hall, Leeds. 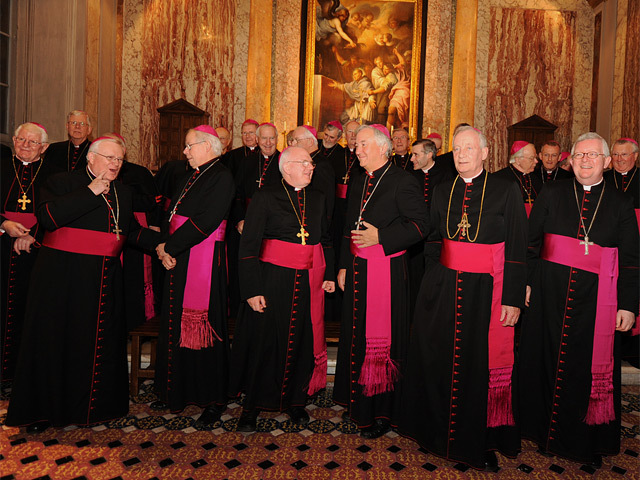 As bishops we meet in Conference twice annually, though obviously other gatherings of committees etc take place throughout the year. The agenda for these important meetings has at its heart how can we as pastors best serve that part of the Church placed in our care. 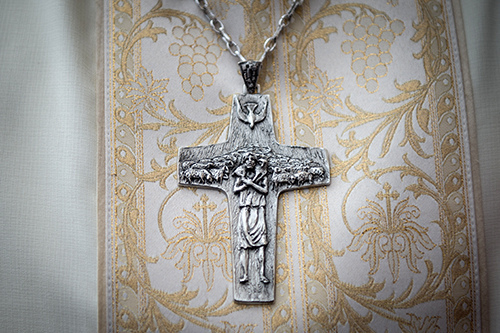 How can we inspire and guide our priests and people to live the Christian life in the increasingly complex and challenging conditions of the modern age? 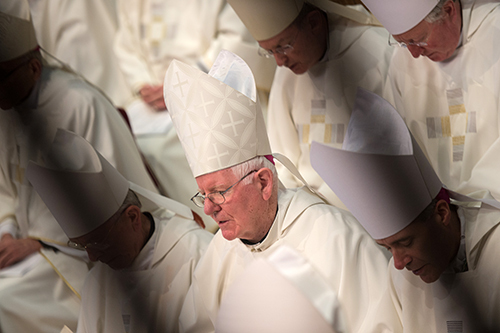 The Conference offers us bishops the opportunity to pray and reflect together as we try to come to a common mind on various significant issues, such as those relating to marriage and the family, and to reiterate Catholic teaching on the inherent dignity of human life at every moment of its existence. The outcome of our deliberations and subsequent resolutions are now available here. This particular Conference also allowed us to welcome and congratulate our new Cardinal, Vincent Nichols – so as to express our pleasure at his appointment as a close collaborator with the Holy Father, Pope Francis. 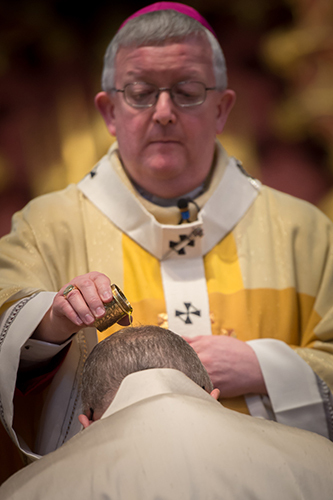 We also welcomed the new Archbishop of Liverpool & Metropolitan for the Northern Province Archbishop Malcolm McMahon and pray especially, too, for newly-appointed Bishop Mark O’Toole and even more recently named Bishops-Elect Robert Byrne, Nicholas Hudson & Alan Williams SM. 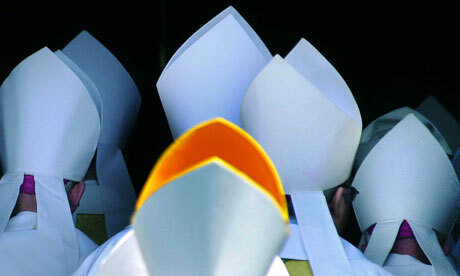 The World Day of Prayer for Vocations is celebrated on Sunday 11 May this year, the Fourth Sunday of Easter. 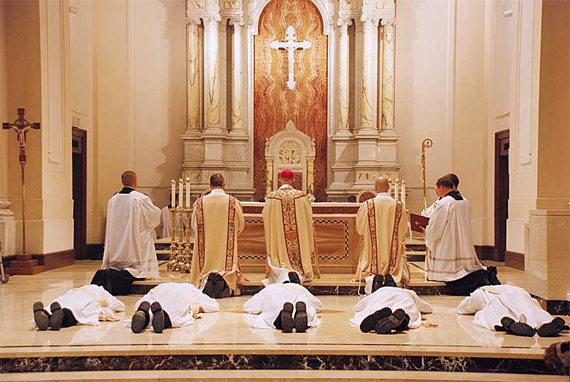 The World Day of Prayer for Vocations is also known as Vocations Sunday or Good Shepherd Sunday. 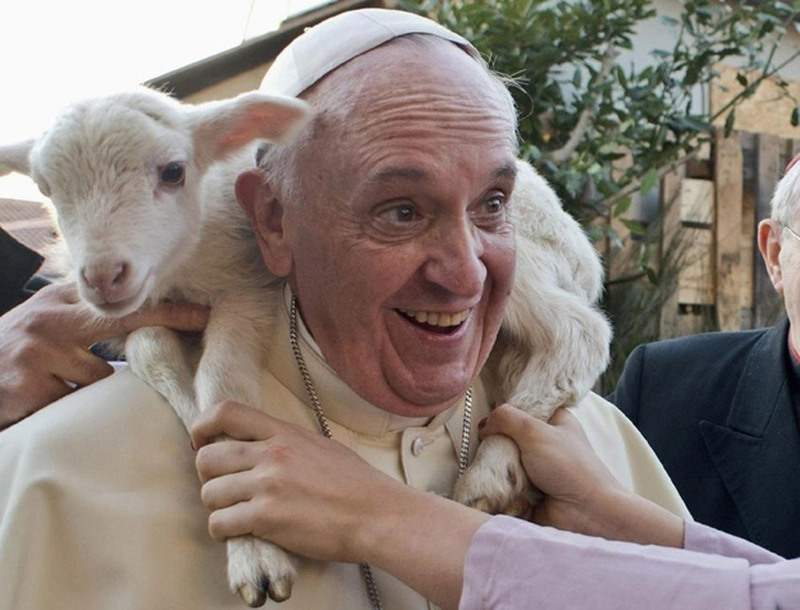 Pope Francis has a simple way of both speaking and living. He has used many memorable phrases and images to communicate the ‘Joy of the Gospel’ – but, most of all, he shares that joy in the way he interacts with people. However, this Gospel joy is not just a pleasurable or light and fluffy feeling, It is an inner joy born of mission. 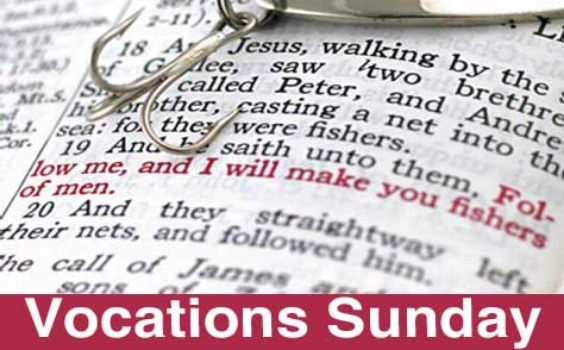 In his message for this year’s Vocations Sunday 2014, he encourages all in the Church to expect great things from God, and from ourselves in his service. Joy for that sort of disciple enables him or her to venture beyond the narrow limits of our comfort zones. That means taking risks, being prepared to journey, allowing God to be God in our lives. 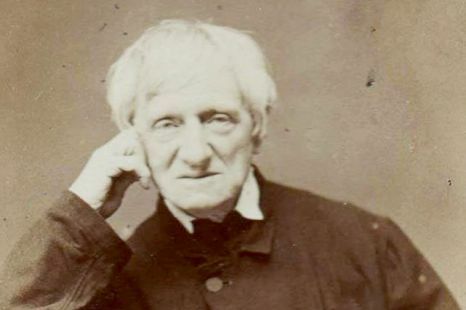 In Evangelii Gaudium, he wrote of the “unruly freedom” of the Word of God, for “we are neither its masters or owners, but its guardians, heralds and servants”. In this year’s Message, the Holy Father calls for heroes who will go into the great harvest where many people are harassed and helpless, like sheep without a shepherd. ‘And the harvest will be plentiful’. 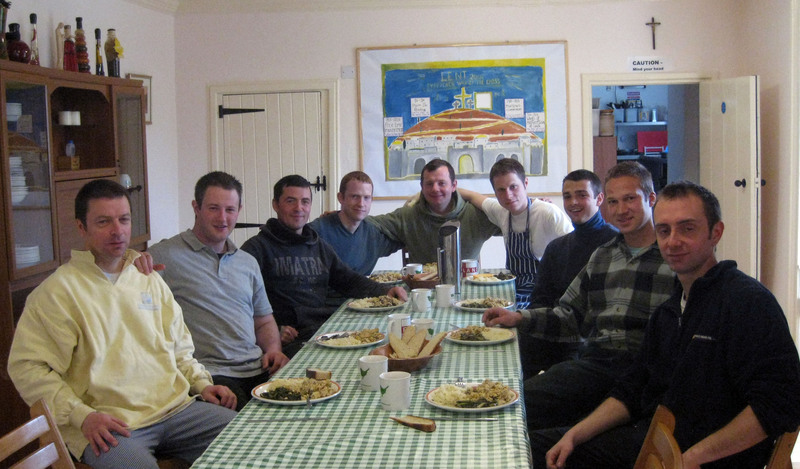 My own Pastoral Letter for Good Shepherd Sunday this year seeks to be a rather direct appeal to young Catholic men to ‘step out’ in faith and consider our own pressing need – as a Local Church – for good priests after the Lord’s own heart. Pray with me that the Lord will indeed answer our prayers and do all you can to encourage priestly vocations in the family for our Diocese; at home, at school and at work and, of course, in our parish communities – at every opportunity. P.S. 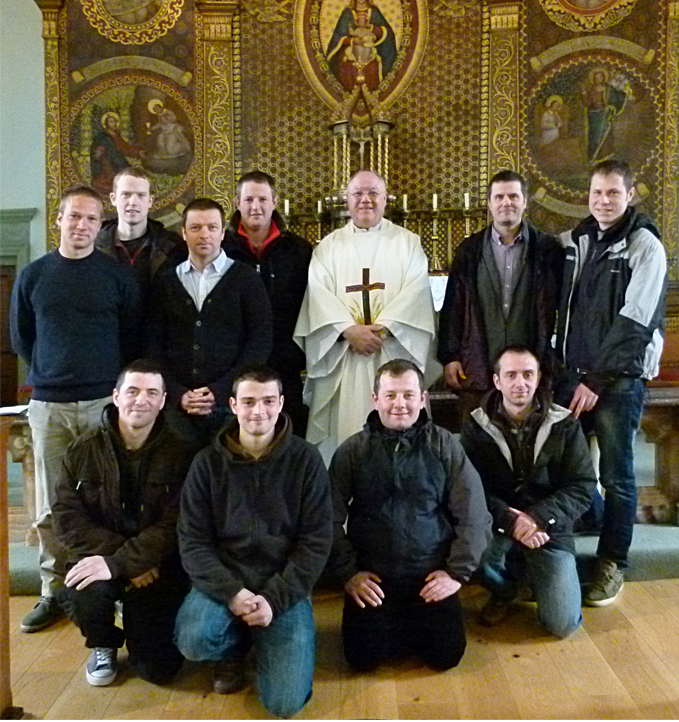 For information on training for the Priesthood for the Diocese of Lancaster contact our Vocations Directors here. 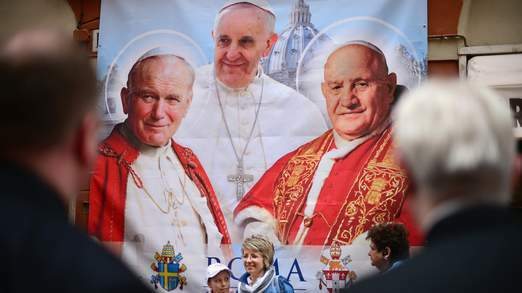 Last Sunday in Rome – Divine Mercy Sunday – the city and the world gathered to witness the Canonization Mass of the two beloved popes John XXIII and John Paul II. 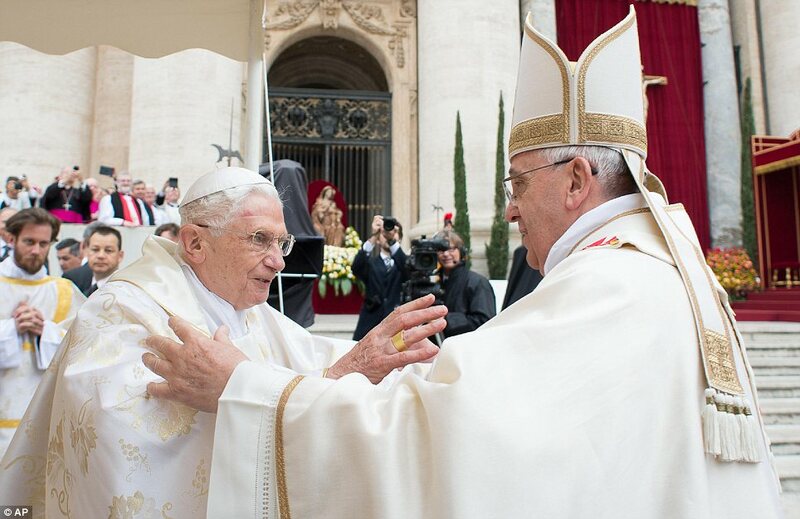 Our current Holy Father Pope Francis was formally petitioned and then made the declaration of sainthood for the two late pontiffs at the begininning the Eucharistic celebration (the pdf liturgical booklet is here) in St Peter’s Square, Rome. 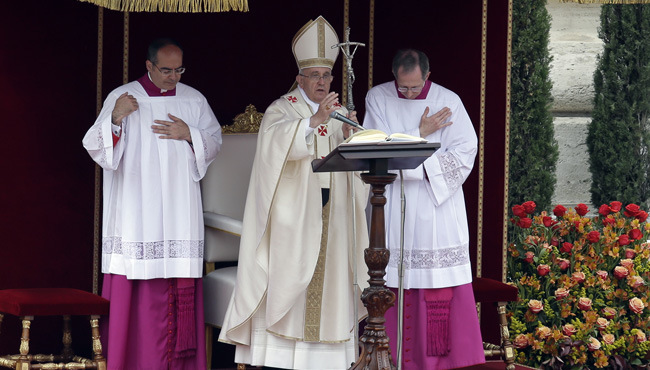 The Holy Father’s homily is here. 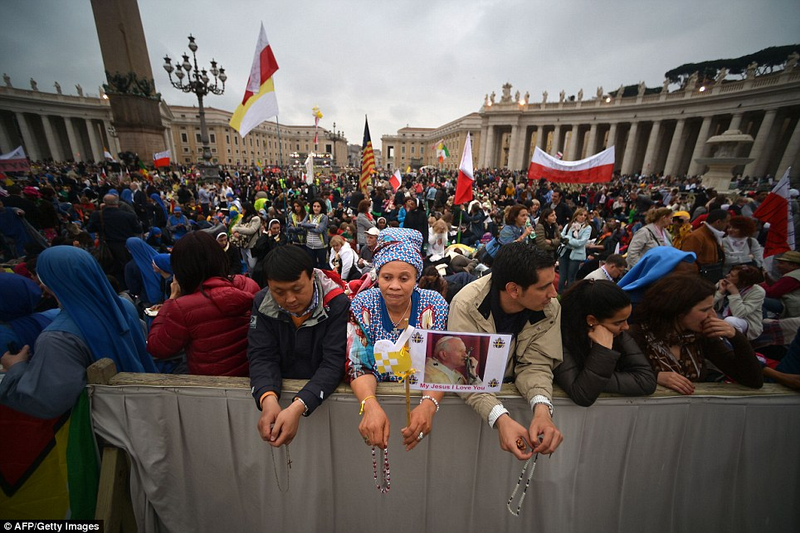 The crowds were enormous with, of course, a huge number of Polish pilgrims – but also from all corners of the earth – all of whom had clearly made great sacrifices to be present in St Peter’s Square and the surrounding streets and squares in Rome. 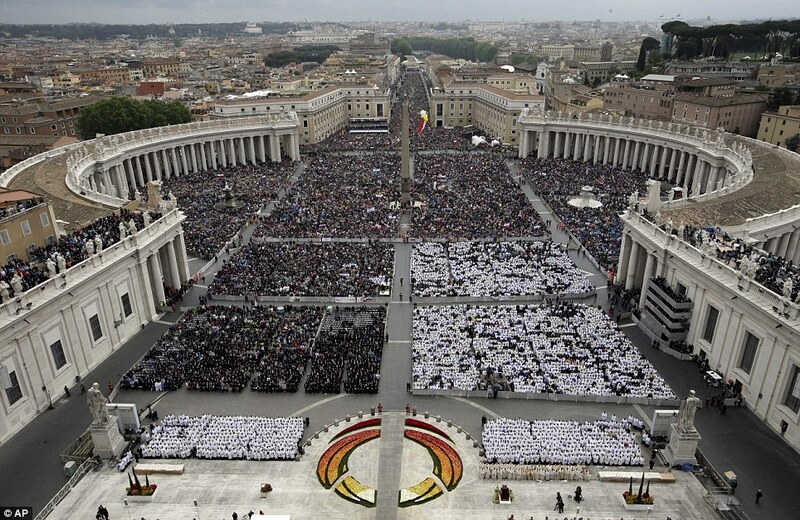 Although I was not there in person – I watched the wonderful spectacle on the TV and was amazed by the numbers of people – especially young people – and the way that there was such a prayerful silence during the Mass. 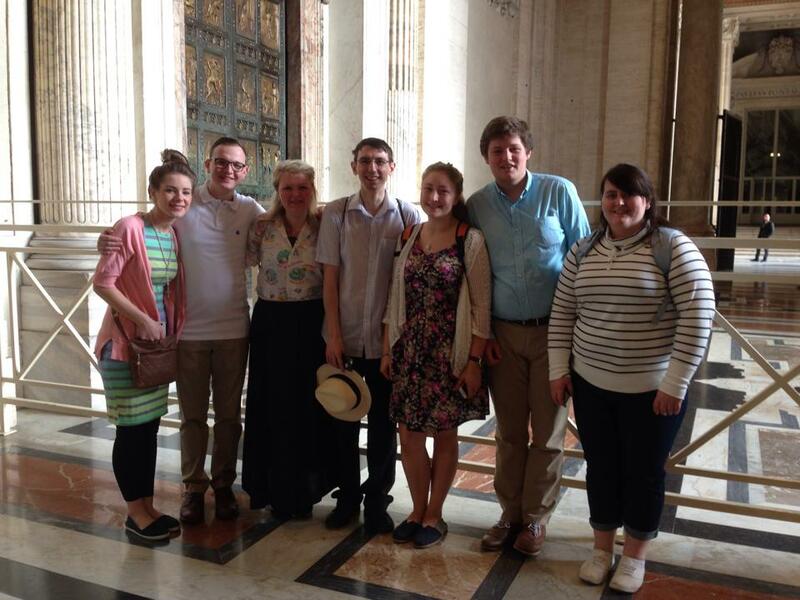 I was particularly delighted that as many as twenty – mostly – young people from the Diocese attended the celebrations in Rome and remembered the intentions of the Diocese on their pilgrimage in honour of these great – and saintly – successors of Peter – and now officially ‘models of holiness’. 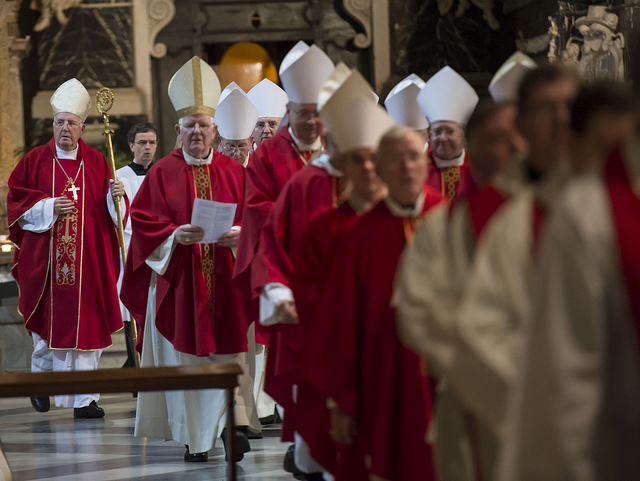 It was great joy to see Pope Emeritus Benedict present for the Mass and concelebrating along with the Cardinals –including our own Cardinal Vincent Nichols and Cardinal Cormac Murphy-O’Connor. 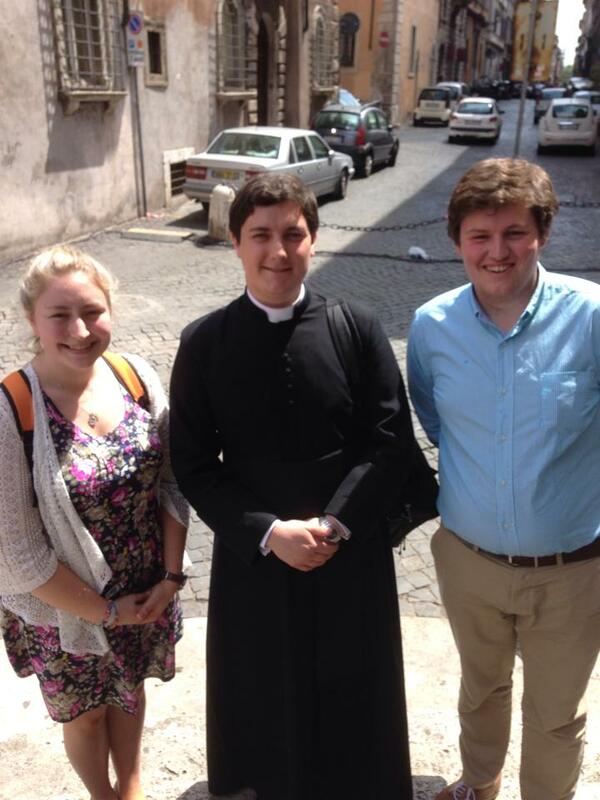 There were priests in Rome too! 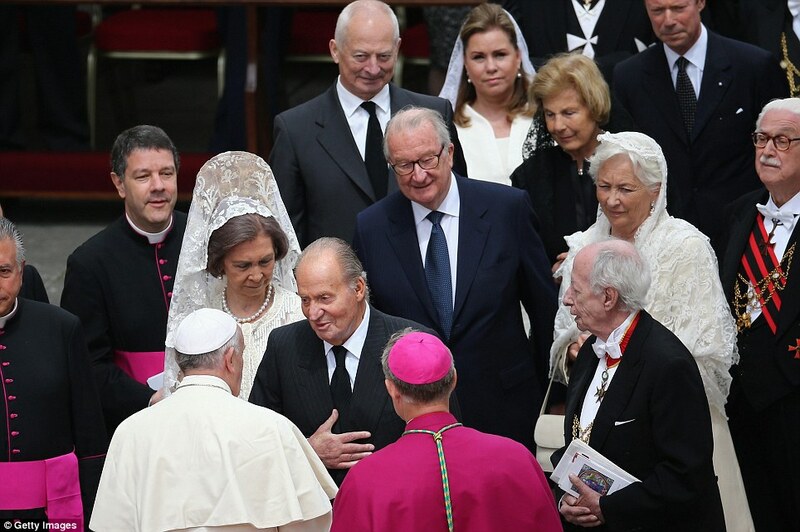 As well as almost a million people in Rome many heads of state or their representatives also attended given the significance of the event – a moment in history. 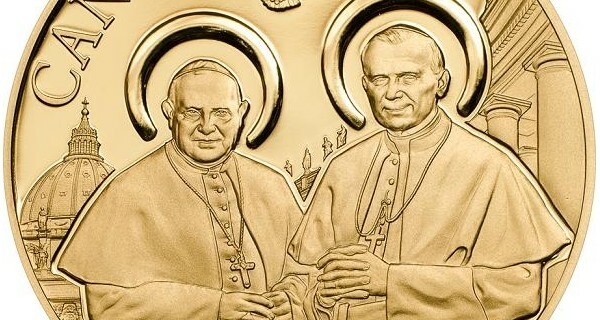 Clearly, the reason for this great outpouring of affection is that these two popes have had a very profound and pronounced influence on the history of the world and the history of the Church. Pope John XXIII, proved to be no ‘caretaker’ pope and surprised the world initiating the great renewal in the Church with the Second Vatican Council. He really began the great ecumenical movement in the life of the Church which is still working itself out for us today. Many in Britain remember with grateful affection wonderful Pastoral Visit of Pope John Paul II to our countries in 1982. 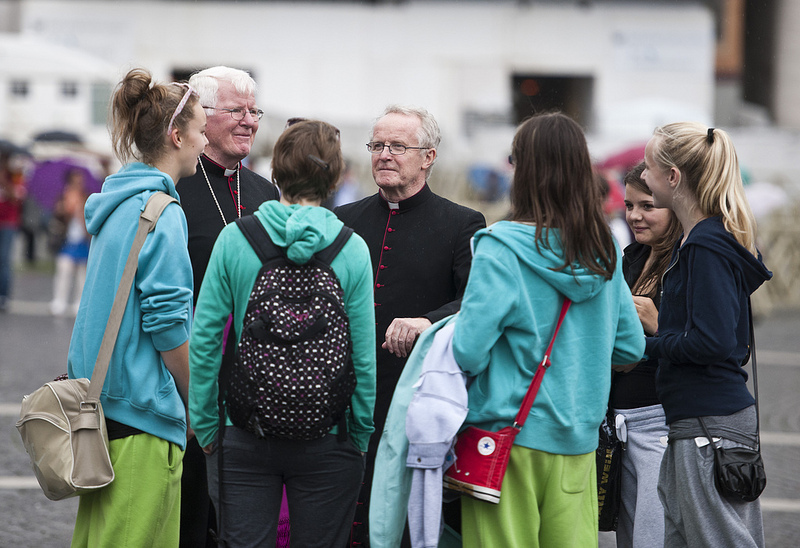 And so it is also that many of our young people from our Diocese have had the opportunity to travel to World Youth Days throughout the world – these days were the initiative of Pope St John Paul II! 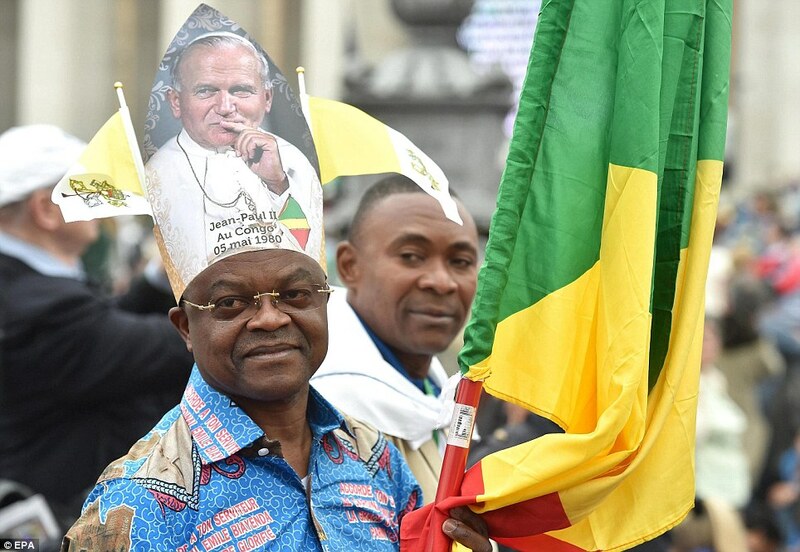 In fact, Pope John Paul II made more than 100 missionary trips throughout the world, and because of this was seen by many millions of people around the world. It is said he was seen in person by more people than anyone else in the history of the world. Back at home this week, I’ve had various meetings including on Wednesday a meeting of the Trustees of the Royal English College, Valladolid – and so enjoying the wonderful hospitality of Archbishop Bernard Longley at Archbishop’s House, Birmingham. 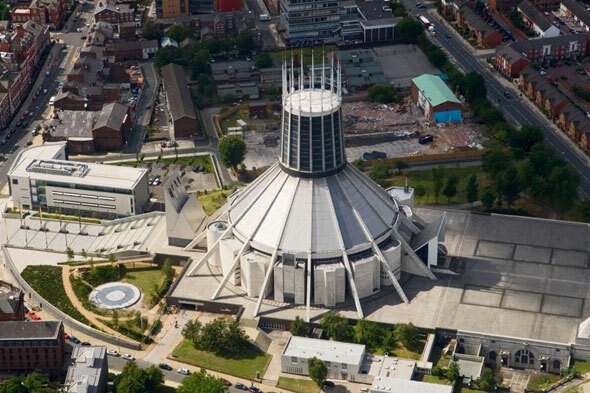 From here, I travelled on Thursday morning to Liverpool for the Mass of Installation of its new Archbishop, Bishop Malcom McMahon OP, formerly Bishop of Nottingham. The liturgical setting for the Mass of Installation was the splendid Metropolitan Cathedral of Christ the King. 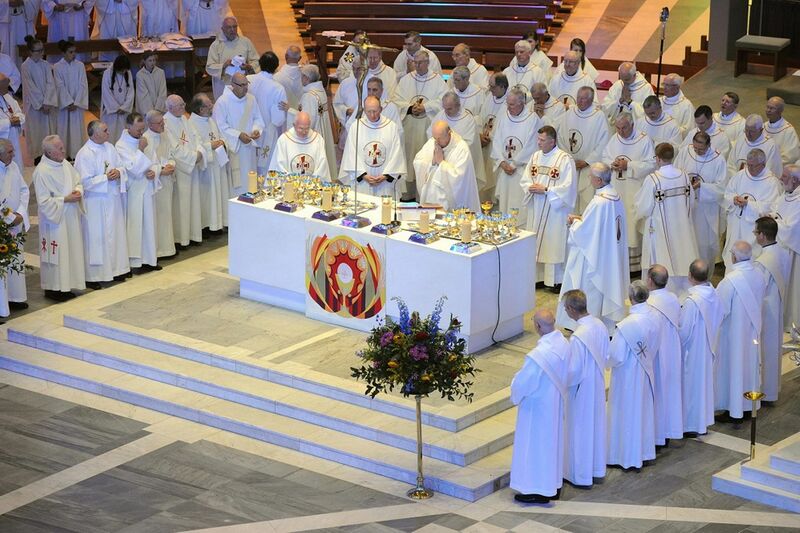 A large number of bishops concelebrated the Mass with Archbishop Malcolm. 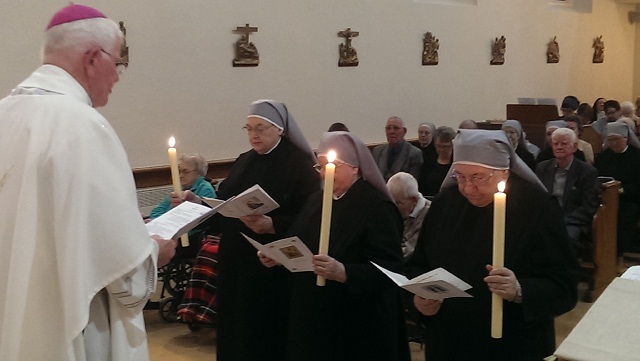 As well as the large attendance of clergy and laity from the Liverpool Archdiocese, many travelled from Nottingham and elsewhere to be present for the occasion. 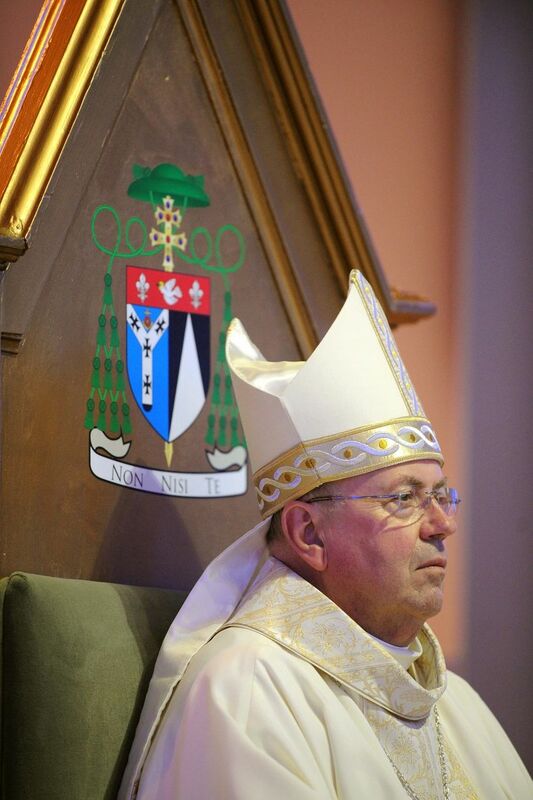 The new Archbishop was conducted to his ‘cathedra’ or Episcopal chair, the symbol of his teaching authority as pastor by Bishop Thomas Williams who was Apostolic Administrator during the vacancy following Archbishop Kelly’s resignation. 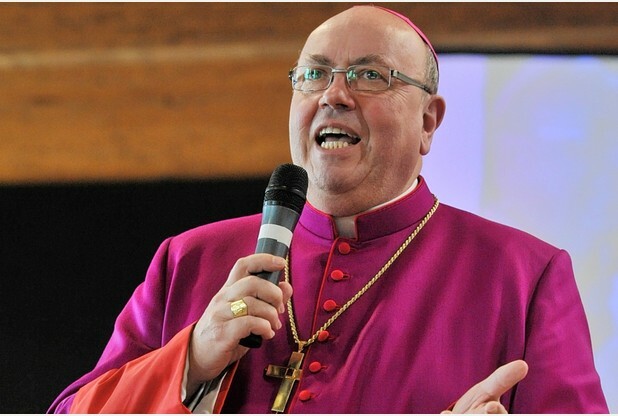 The Archbishop’s task now is to proclaim the fullness of the gospel to the people of the archdiocese of Liverpool. The presence of the Apostolic Nuncio, the papal representative, underlined the communion of the new archbishop with Pope Francis, the successor of Peter, and that precious link which we call apostolic succession. 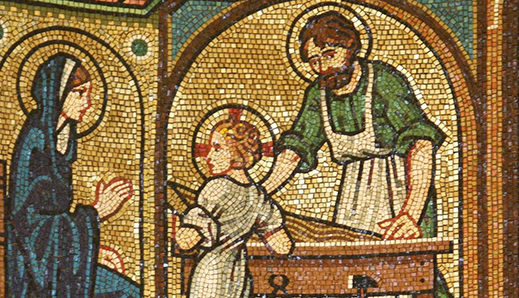 Archbishop McMahon specifically chose the Feast of St. Joseph the Worker to begin his Episcopal ministry in the See of Liverpool, and in his homily drew lessons from the character of the Saint for the life of the Church today. As guardian of the Holy Family, Joseph carried and was carried by the Son of God, emblematic for us as believers and witnesses in our world. The Archbishop also noted how Joseph by taking Mary as his wife broke with the conventions of his day and so obeyed God’s will. 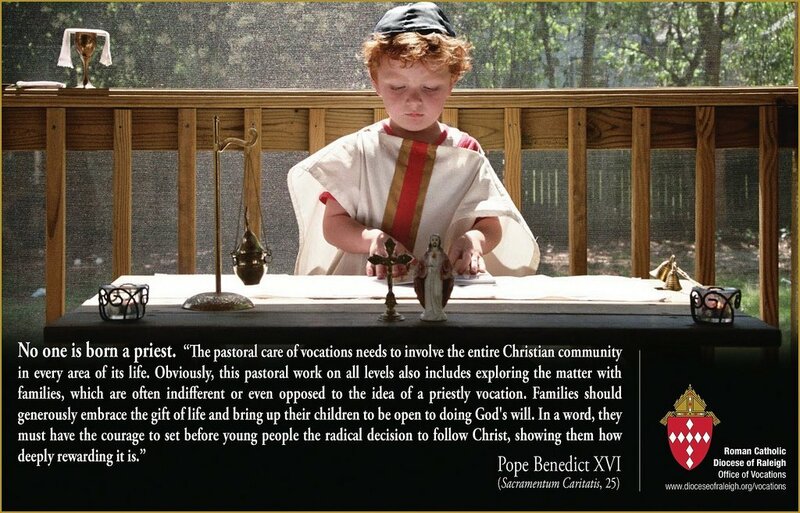 We Catholics also should not be afraid to move out and, as it were, break new ground. The Archbishop gave us all much to think about in his installation homily. 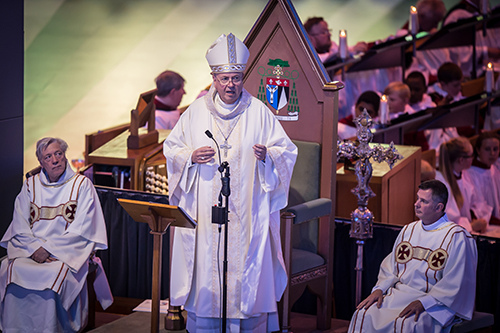 The full text of his homily is here. 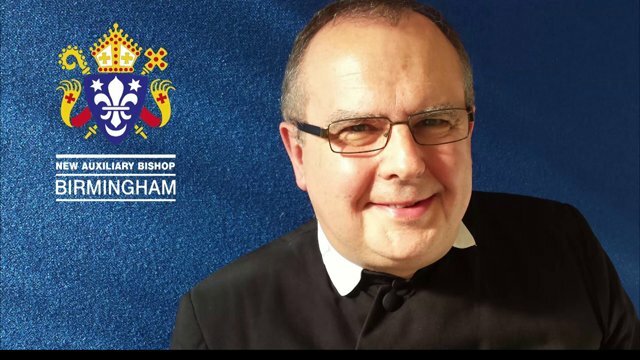 The Catholic Church in Liverpool, West Lancashire and the Isle of Man now rejoices that it has once again a chief pastor to shepherd it in the ways of the Lord. 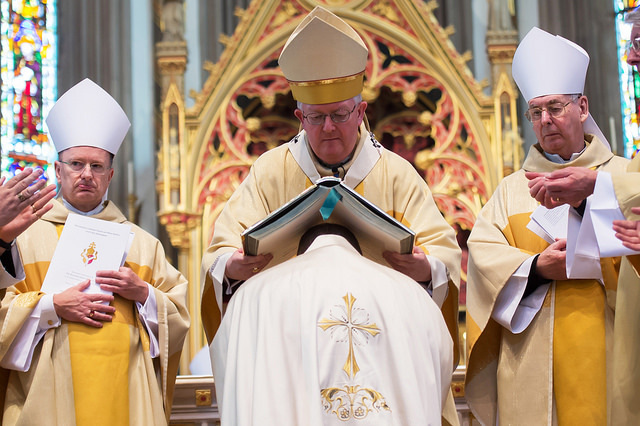 As our own Metropolitan, we wish Archbishop Malcom well in his new ministry and assure him of our prayers and support from north of the Ribble!